This photo was taken in 2002 at the cemetery in Linsfort Glebe, home of William McLaughlin Sr. The photographer: Maureen McLaughlin Lester, youngest daughter of Edward F. McLaughlin. William McLaughlin Sr. (1793-1853) was born in Ireland and lived on the western shore of the peninsula of Inishowen on the east shore of Lough Swilly (pronounced Sooley) in the hamlet of Linsfort Glebe in the Parish of Desertegny in County Donegal, 14 miles from the city of Londonderry. He and his wife, Molly Quigley (1796-1856), may have had eleven children, though information has surfaced only on nine of them. Most of their children emigrated to the United States. Those children are listed below. The first nine appear in the birth order provided by the Bible of Rose Ann McLaughlin, who married John Major. Rose was a granddaughter of William and Molly McLaughlin. Her Bible names nine children for her grandparents, making no mention of George or Daniel McLaughlin, whose names appear in "This History of the McLaughlin Family", written in 1979 by the late Edward F. McLaughlin, Justice of the New York State Supreme Court, who also was descended from William and Molly McLaughlin. That book is the source of most of the material that appears in our McLaughlin family tree. So far, ten years after starting this project, I have found nothing further on the existence George or Daniel McLaughlin or whether they actually were sons of William McLaughlin Sr. Thus I am inclined to trust Rose McLaughlin Major's notes, concluding there were nine children – five sons, four daughters. Branches of this family tree appear on other pages. Overall, there is a lot of missing information. If you have some of it, please let us know. Contact us at jmajor9863@aol.com. James McLaughlin (1821-1911) and his wife, Ann McKinney (1822-1888), were the first members of the family to leave Ireland for the United States, emigrating in 1848. They settled in Skaneateles, NY. He bought 40 acres in Skaneateles, started the teasel business, and picked up a new nickname. Mary McLaughlin went to England from Ireland. According to Rose McLaughlin Major's Bible, Mary married a man named O'Conner and is buried in Edgefield Oldham County, England. John McLaughlin was the twin brother of Helen (aka Ellen) McLaughlin. He arrived in New York from Ireland on Dec. 7, 1851 aboard a ship called Vanguard. He settled in Skaneateles, but moved to Louisville, Kentucky, in 1858, returning to Skaneateles in May, 1868. Helen McLaughlin married Timothy Donohue. They remained in Skaneateles, though some family historians mistakenly reported that they had moved to Schenectady. Helen McLaughlin Donohue did spend the last several years of her life there, moving to Schenectady after her husband died in 1913. It was their son, Timothy E. Donohue, who had settled in Schenectady. It also was Timothy E. Donohue who provided one of three connections between the McLaughlins and the Majors when he married Margaret Major, a daughter of Charles J. Major, in 1898. Cornelius McLaughlin left his home in County Donegal, Ireland, in 1866, and took his son, William, to Skaneateles, NY. He returned to Ireland, but left William with one of Cornelius's brothers, James "40 Acres" McLaughlin Sr.
Hugh McLaughlin was born in Donegal, emigrated to the United States in 1854. He married Mary J. McCready. They lived in Queens, later moved to Brooklyn where he was engaged in the furniture business. Hugh McLaughlin, an early resident of Skaneateles, died Wednesday, January 19, 1916, at the home of his daughter, Mrs. William Russell of Fulton Avenue, Brooklyn, N.Y. in the 81st year of his age. He was born on the eastern shore of the peninsula of Inishowen in Linsfort Glebe, County Donegal, Ireland, and came to America with his sister, Mrs. Helen Donohue in the year 1854. Having resided in Skaneateles for several years, he went to Brooklyn where he soon married Miss Mary J. McCready of that city. During the many years of his residency in Brooklyn, Mr. McLaughlin has been engaged in the furniture business. William McLaughlin (1836-1909) married Mary McHugh (1842-1908) in County Donegal, Ireland. The moved to Skaneateles, NY after the birth of their first child. Catherine McLaughlin (1840-1891) m. Patrick Curtin in Limerick, Ireland. Rose McLaughlin Major's Bible notes that Kate's daughter, Alice, died Aug. 3, 1879. Apparently Catherine and Patrick Curtin also emigrated to America, probably the Skaneateles area. What's uncertain is when they left Ireland. One on-line source says 1850, which is doubtful. Rose Major may have had her dates wrong, but she listed Kate McLaughlin as the last of nine children, born in 1840. "This History of the McLaughlin Family" says George McLaughlin emigrated to the United States and became a doctor in Philadelphia. I've found nothing to verify that William McLaughlin Sr. and Molly Quigley had a son name George. There is no information on anyone named Daniel McLaughlin who could have been a son of William and Mary McLaughlin. The name is listed here because it appears in "This History of the McLaughlin Family." My paternal grandmother, Rose McLaughlin Major, was the granddaughter of William McLaughlin Sr. and Molly Quigley. Though I grew up in the industrial village of Solvay, NY, just outside of Syracuse, much of my extended family lived in Skaneateles, about 20 miles away. This is where James "40 Acres" McLaughlin had settled after he left Ireland. James was the first child of Molly and William McLaughlin to emigrate to the United States. Why Skaneateles was his destination, I do not know. There already were other McLaughlins there; perhaps they were relatives. That may be the reason James put down roots in the Skaneateles area, but that does not explain why earlier McLaughlins chose Central New York, though geography may have been a factor. Photos of Linsfort Glebe, home of William McLaughlin Sr., show an area that greatly resembles the hills that line the east and west shores of beautiful Skaneateles Lake. That said, there remains the possibility "40 Acres" wasn't the first member of his family to settle in America. My father's Aunt Liz Major, the self-designated family historian, always claimed that we had a connection with Dr. John McLaughlin, whose grandfather may have been a brother of William McLaughlin Sr.'s grandfather. That, however, is pure speculation, though I discovered over several years that Liz Major's claims were usually well-founded, no matter how unlikely they seemed the first time I heard them. One problem with this particular theory — and it's actually a small problem, all things considered — is that Oregon's John McLaughlin spelled his last name with an "o", not an "a" — as in McLoughlin. Such discrepancies complicate family histories. This is especially true in our family's Dougherty connection. Some relatives spelled their last name Doherty. Even siblings went their separate ways on the spelling. 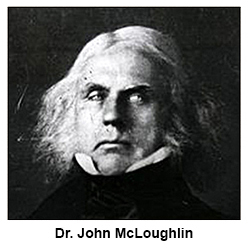 Whatever, Dr. John McLoughlin was a colorful character, who looked like a cross between Andrew Jackson and John Brown, with white hair that looked wind-blown even on a windless day. He left Canada and made a name for himself in northwestern United State and was nicknamed "The Father of Oregon." Whether the family of William McLaughlin Sr. had originated in Scotland, as many McLaughlin families did, I have no idea. 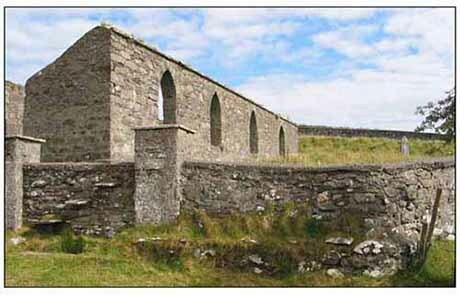 But in the 1700s William McLaughlin and his family also were living in County Donegal. Both the McLoughlins and the McLaughlins were Catholic, which may be significant. But the rest of this page is concerned with the children of William McLaughlin Sr. and Molly Quigley. Those we've been able to trace are linked to pages that display their branches on our family tree, though these branches are incomplete and may contain some errors.